Before having chickens of my own I though this was the gold standard of eggs and what I should look for. You don’t want eggs from chickens that are confined, right? Well, when looking into the horror that is factory egg production I realized that a “Free Range” stamp was not all it is cracked up to be. So I stopped buying ‘store’ eggs and started buying from a person selling her “farm fresh” eggs from her house. Just going on taste, I was hooked and started thinking more and more about raising my own chickens for eggs. So, commercially “free range” is not a big improvement (nor is it actually free ranging)… but for my backyard chickens, going free range is still a better choice, right? Not for everyone. In our Chicken Help pages, we recommend free range flock management, but point out that it isn’t always the best choice for everyone. 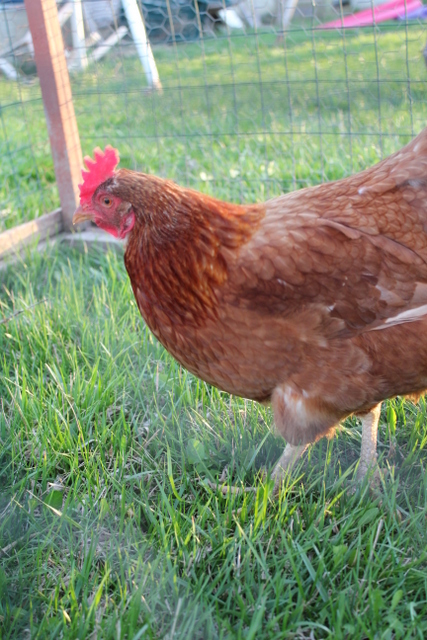 Shannon has blogged about why free ranging didn’t work for her. Now I’ll explain why it doesn’t work for me. Isa happily protected while exploring a fresh patch of lawn. Ideally, I would love to free range my flock. I have this utopian vision of a farm house with chickens all around. Maybe someday that will be my reality—but right now it isn’t. Two big reasons not to free range are 1. neighbors and 2. predators, and I have both. Although I do live out in the country on 37 acres, I have close neighbors. I’m not worried about the neighbors complaining or doing anything to harm my chickens—but I am worried about their dog! They have a German shepherd that often breaks free and thinks it’s great fun to harass the chickens. Other predators? Oh, we’ve got them, too. In addition to the neighbors’ dog, we have raccoons, mink, opossum, fox, skunks, coyotes, snakes and red tailed hawks. If you read all the links I just listed you’ll be afraid to let your chickens go anywhere or do anything! Since most people that free range still lock their chickens up in a coop at night, I’m mostly worried about the daytime predators: dogs and hawks. I don’t want to fence in my whole yard just to keep a dog out, so my chickens stay confined. For now, I’m ok with having chickens in a confined range. The compromise that works for me is having a chicken tractor. This gives me the ability to give my girls fresh pasture every day while still keeping them safe and secure. So although my eggs aren’t really “free range,” my hens have a great, SAFE, life—and they make much healthier eggs than any egg I can buy in a store today. We use tractors for the same reasons. Me too….I tried free range but couldn’t rid the area of coyotes. Now my girls spend time between their yard and 2 tractors. I have 3 dogs, 2 of which are not a threat. The other is under “chicken restriction. Chickens always go back to the hen house at dark. As an experiment, I let mine out of the coop at 7 pm. It gets dark at 8:30 PM. I stay with them outside and it has worked well despite some resident eagles and a red tail hawk. In fact, they liked it so much, they line up along the fence at dusk, letting me know they wanted out. This article could have been written by me,here in central KY. After losing too many chickens to many different predators, in different years, I now keep mine confined in coops with run, horse stalls and my house garage. If I have time to stay & watch them they get to go out & free range. Otherwise I make up for not free rangeing with their diets. Mine are healthy & their eggs are beautiful and very tasty. Now with the Avaian Flu running rapid in our USA, I am so happy that I have my chickens housed as I do, wild birds fenced out ! Your reasons are the same as mine. Because of predators, after losing a few birds I let them out only for an hour in late afternoon, and they loved it, but I had to be there to supervise. This daily commitment became onerous. Still, there were accidents. For example, although my cat never aggressively bothered the birds and avoided them, when a too-confident chicken got too close, one warning swipe of his paw split open the skin over her crop, and I had to put her down immediately. A Rhode Island Red, she was my favorite bird. You need a better dog. My run is attached to the coop and is essentially Fort Knox. I don’t bury the hardware cloth, it’s aproned around the run. The entire run, as well as the windows on the coop, is covered with hardware cloth. It was expensive, but worth it. I’ve never lost a chicken to a predator though I have lots of hawks, foxes, neighborhood dogs and raccoons that have tried. Foxes actually lie right alongside the run and stare at the chickens, hawks land on the hardware cloth roof on the run and watch the chickens. But the hens are safe. I let them out but only when we’re home to keep on them. My biggest consistent threat is the neighborhood dogs. They’ve attacked my girls on multiple occasions with great remorse from the dogs’ owners. Poorly trained dogs are the greatest threat to suburban chickens. I’ve had this set-up since 2011. I agree with Jo Anne you need a better dog. I know of several of us free rangers and we rarely loose a bird to a predator. Roosters are also great protectors. The dog doesn’t need to be a brute. It’s best to have 2 dogs. We have seen every predator in the US except wolves, and there maybe some of those here too. I find that chicken tractors are such a pain having to move them. I use a paddock system with gates that open or shut to keep the chickens in or out of an area. I have several pastures of sufficient size that the birds don’t over graze it although there is nothing growing close to the hen house. I use 6 foot fencing and the cheapest I can find. chickens won’t put pressure on it. Predators won’t be stopped by it but it helps the dogs manage the predators and keeps the dogs where the chickens are. A mutt from the shelter that is good with chickens is good enough as long as it’s not scared of it’s shadow. I don’t know of anyone in my area that has lost a chicken to a hawk. They respect dogs and roosters. My neighbor saw a hawk land on a hen once and the rooster tore it up. Usually they notice the hawk and they all run for cover and usually it’s where the dog is. Free range doesn’t necessarily mean a peaceful chicken or flock. They tend to be constantly aware of possible or actual predator. This can range from family pets, the neighbors animals (Even though we live on 60 acres). The worst for us has been the Great Horned Owl’s. They glide and fly silently and only eat the head. Also, a great many coyote’s and due to this being pasture and forest we have feral cats people have forgotten about years ago….though we rarely see them. They spend most of their time in a 50 x 50′ 6ft permanent yard with mesh covering and summer time I take groups to a portable run.